“Big Bang” diameter 44.5 mm in brushed, polished black ceramic. Matt black ceramic bezel with 6 H-shaped titanium screws, polished and blocked. Titanium back with sapphire crystal. 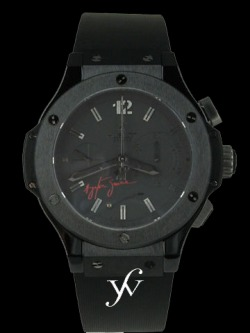 Adjustable natural smooth black rubber strap with engraved Hublot logo.